Breeding Sows: Mr. Elias Putnam of Danvers won best ($8) but Mr. Jonathan Osborne of Salem won second best ($5). Bulls: Mr. Ezekiel Hersey Derby, Esq. awarded first prize ($15) for his “deep red bull of two years old”. Noted also are his “very handsome” heifers. Cows: Mr. John Barr, Esq. awarded first prize ($15) for his seven-year-old “bright red cow”; Mr. Aaron Waitt, Esq. awarded third prize ($5) for his six-year-old “light red cow”. Domestic Manufactures: (Salem residents dominated in this category, I must say, although it seems to have been an exhibition rather than a competition). Imitation Beaver Hats: from Major Samuel Mansfield’s Factory, Salem: water-proof, highly recommended for beauty and economy: “they exhibit an admirable imitation, formed by the skillful use of cheap materials–the nap of muskrat is laid upon lambswool bodies, which are stiffened with gum shellac”. Imitation Merino Shawls: by Mrs. Thompson of Salem. Cotton and wool carded together, rich colors, exhibiting “great taste and skill”. Imitation Leghorn Bonnets: from Miss Mary Raymond of Salem “the happiest imitation in point of color”. “Beautiful specimens of Vitriol and Alum” : from the Salem Laboratory (must research this). Carpeting: “a well-executed piece of Venitian carpeting” from Mrs. Dwinnel of Salem and “Gobelin-worked Crickets” by the young Misses Page of Danvers are praised–what are Gobelin-worked Crickets???????????? The Ploughing Competition: this seems to have been the highlight of the exhibition, but the root vegetables (see below) received much commentary as well. Benjamin Savory of Newbury won, but Mr. Ezekiel Hersey Derby came in second, with his team of oxen driven by Henry Barrich, ploughman, who ploughed 36 furrows, 6 inches deep, in 70 minutes, “very handsomely”. First Prize ($15) to Mr. John Dwinnel of Salem: 360 bushels raised on a half-acre. Mr. Dwinnel also received second prize for his potatoes. Second Prize ($10) to Mr. James S. Cate of Salem: 276 bushels raised on a half-acre. Fourth Prize ($5) to Mr. Ezekiel H. Derby, Esq. of Salem: 256 bushels raised on a half-acre. There seems to have been intense interest in root and fodder crops at this time, so there were also “claims” or documented harvests of certain crops including rutabaga and “mangel wurtzel”, a kind of beet. Mr. Derby submitted a claim for the latter: reaping 287 bushels of the crop from a half-acre of land, “twice-ploughed and received a slight dressing of manure”, along with Russian radishes and Swedish turnips. The seed was sown on May 23, 1821, and the crop harvested between October 27 and November 3rd. The Salem surveyor came out to verify the claim. Such information in this report! It makes me want to abandon my ongoing exploration of cultural and social history and become an old-fashioned agricultural historian! 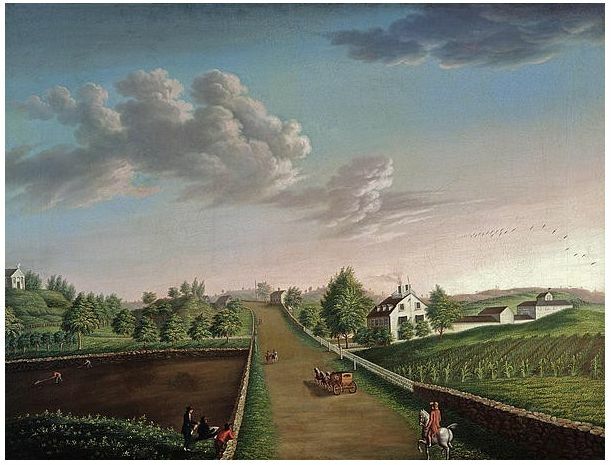 It’s no surprise to any Salem historian to see Ezekiel Hersey Derby so oft-mentioned in this account, however, as there is an amazing painting of his family farm in South Salem by the Salem émigré artist Michele Felice Corné dated from about 20 years earlier in the collection of Historic New England. I walk by the former site of this farm (basically Lafayette and Ocean Streets) on my way to work, and generally I think about what it looked like before the Great Salem Fire of 1914, but now I have an entirely new pastoral perspective. Cornè, Michele Felice (1752-1845) Ezekiel Hersey Derby Farm, c. 1800, Cogswell’s Grant, Historic New England. This painting is also notable as it represents the artist and his friend, Salem’s famed architect and woodcarver Samuel McIntire, in the lower left-hand corner adjacent to the fence. 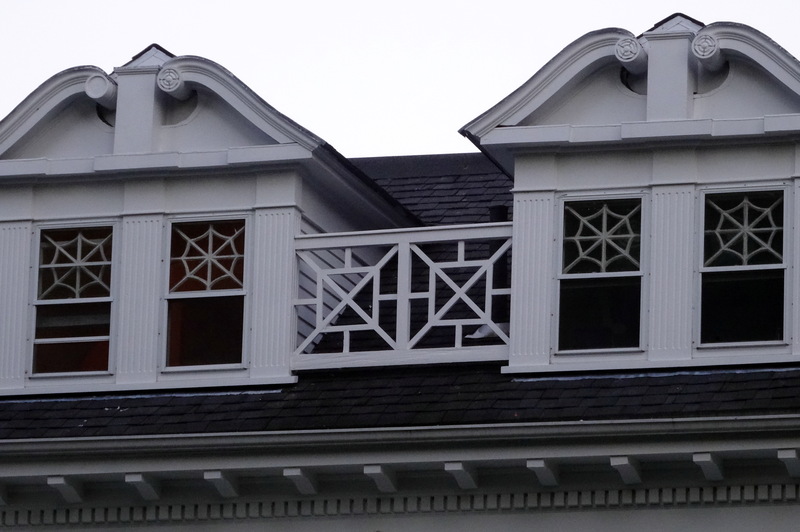 Sitting on the huge back porch of my parents’ house in York Harbor the other day, I became fixated on the spider web design of the windows of the house next door. This house (unfortunately) blocks quite a bit of our view of the ocean, but is (fortunately) a magnificent creation: large and white and gleaming, with lots of architectural details. 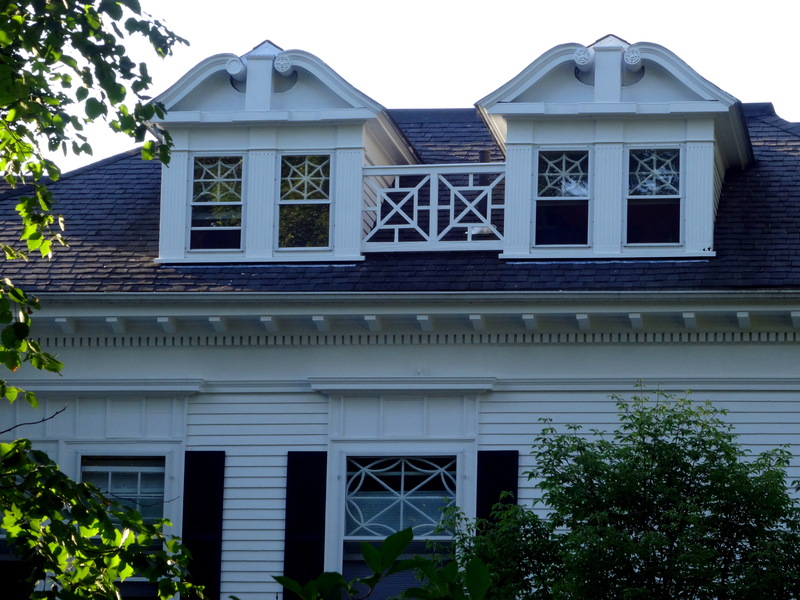 It has the appearance of a Colonial Revival house and I know it was built after our Shingle “cottage”, so the dates fit–but the spider web windows do not: they look a little whimsical for this classically-constrained house. 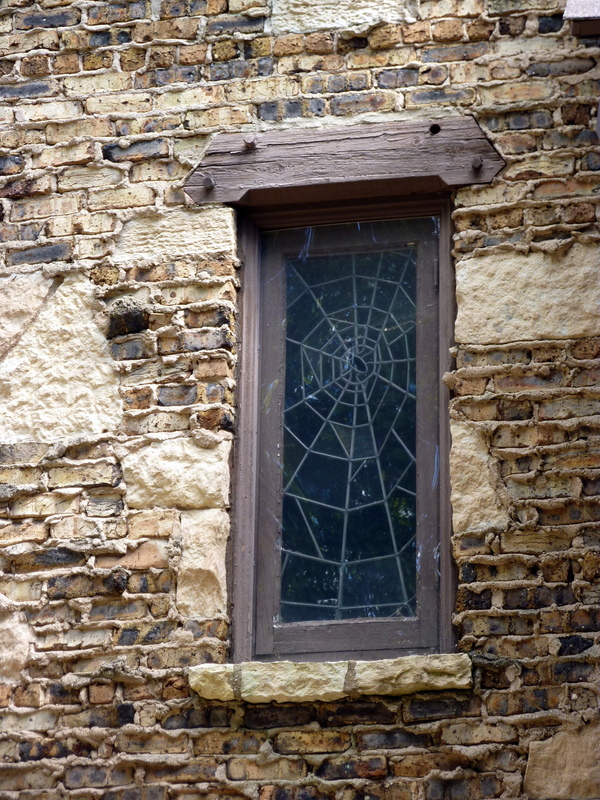 I’ve been looking at these web windows my whole life but never really considered them before. 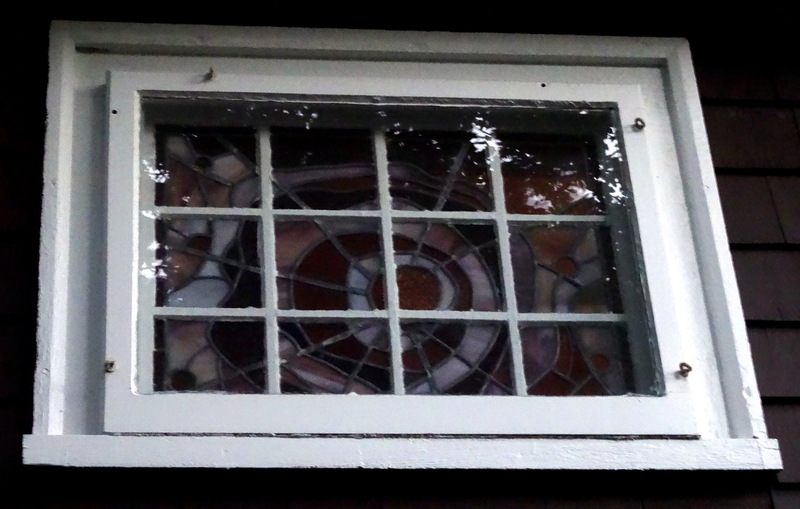 Years ago my mother transformed a small window in the front of our house into a stained-glass mosaic in the design of a web; I doubt she was inspired by the web windows in front as a veritable forest existed between that house and ours at that time. 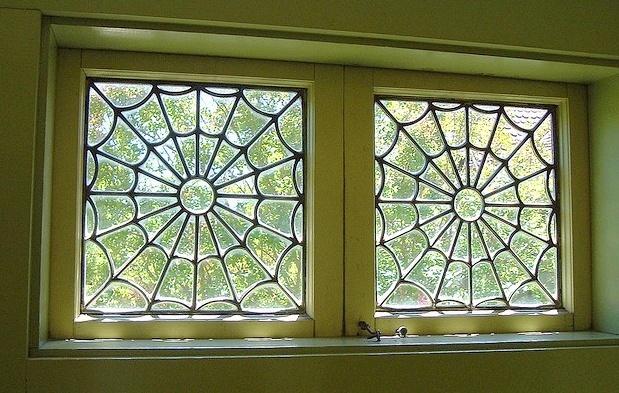 Apparently the spider web was a prominent design motif of the Arts and Crafts movement, along with the dragonfly, the firefly and the crane, all indicating the influence of Japanese visual culture in the later Victorian era on both sides of the Atlantic. Just a few minutes of web research brought me to the spider web windows in the famous Winchester Mystery House in San Jose, California, and more interestingly (to me) to the work of Chicago-era architect R. Harold Zook (1889-1949), who incorporated spider webs motifs in all of his houses and even as his trademark. I had never heard of Zook before: wow! 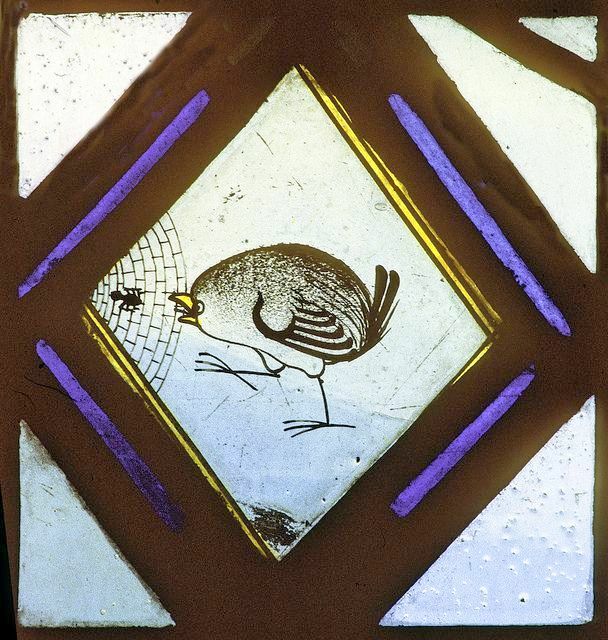 And just to illustrate how ageless and universal the spider web window can be I’ve included a charming little pane from the Zouche Chapel at York Minster, dating from the late medieval era and encased in a chapel panel in the sixteenth century. 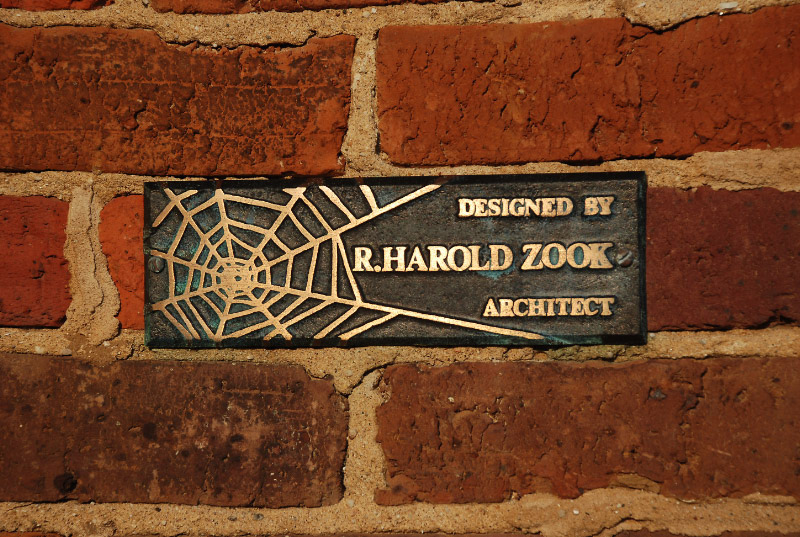 A great site for R. Harold Zook‘s Houses, both lost and surviving.